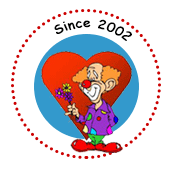 (Poulsbo, Washington) – Caring Clowns International, a 501c (3) charitable organization, received a Gold rating from GuideStar, an online organization which gathers and disseminates information about every IRS-registered nonprofit organization. The GuideStar rating provides information about Caring Clowns International’s mission, legitimacy, impact, reputation, finances, programs, transparency, governance, and so much more. GuideStar is the world’s largest source of information on nonprofit organizations. The organization’s goal is to raise and responsibly donate $5,000,000 to help needy children in the world. To date, Caring Clowns International has donated over $304,000 in funds and equipment supporting many nonprofits in the U.S. and developing countries. Caring Clowns International (www.caringclownsinternational.org) is an all-volunteer, IRS tax-exempt 501(c)(3) charitable nonprofit organization comprised of clowns across the U.S. and several other countries. These clowns donate their time at over 80 events internationally and across the U.S. including orphanages, children’s and other hospitals, events for homeless children and adults, residences for abused women and children, schools for the disabled, retirement centers, VA hospitals, events for kids with down syndrome and disabilities, and children whose parents are in prisons and correctional facilities, community events and private parties. Caring Clowns International members have clowned and supported nonprofits operating in Afghanistan, Angola, Bangladesh, Bolivia, Brazil, Canada, the Caribbean, the Dominican Republic, England, Ethiopia, France, Guatemala, Hong Kong, Italy, Kenya, Mexico, Nepal, Peru, Russia, Sierra Leone, South Africa, South Korea, Thailand, Uganda, the Ukraine, Vietnam, and throughout the United States. Thousands of children and adults have received red clown noses, balloon sculptures, toys and stuffed animals.